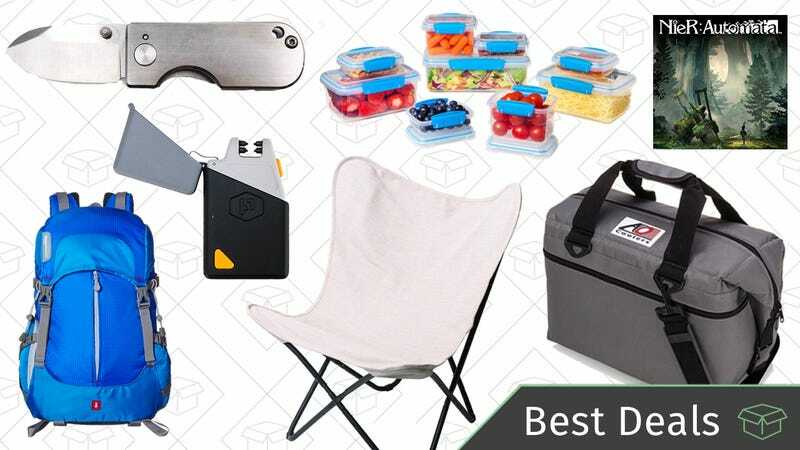 Check out highly-rated AO coolers, an outdoor furniture sale, a plasma lighter, and more deals to start off your weekend. We covered the Sparkr Mini here, and now you can get the 2.0 version of the lighter for an all-time low $19 with promo code L5IMQBFO, down from its usual $30. 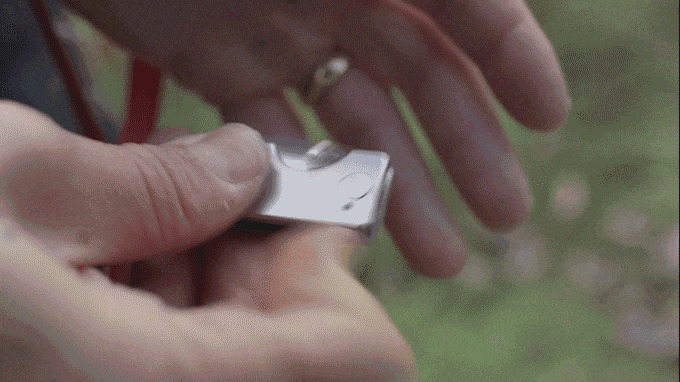 That’s a few bucks more than some other electric lighters we’ve seen, but the Sparkr Mini is one of the most compact models out there, featuring two criss-crossing arcs for a more reliable spark, a built-in flashlight, and a fiddle-friendly flip top. There’s also a newer model on sale for $36 (with code N32PDL4H) that adds dedicated media control keys and typewriter-inspired round key caps. It’s not for everyone, but I think it looks pretty damn cool. If you love inky blacks and vibrant colors—and who doesn’t?—this 2017 OLED LG C7P TV is down to $1397 today on eBay, or $2100 for 65", about $300 and $500 less than Amazon, respectively. Under-desk headphone holders aren’t a new concept, but this one ingeniously incorporates a three-port USB charging hub between its two hooks. That makes a ton of sense wireless over-ears that you want to recharge, but it’s also a great way to charge phones and tablets without dedicating precious desk real estate to charging equipment. Just use promo code SXF4FMGE at checkout to get it for $20. AmazonBasics makes an oddly-specific backpack designed for ourdoor photography enthusiasts, and it’s just $32 today in both blue and orange. The pack is lightweight, has a configurable camera compartment that can hold lenses, flashes, and other accessories, plus a main compartment big enough for a laptop, and straps to hold a tripod. If I could be so bold, I think you should take it on your trip to Costa Rica. Anker has a couple of brand new Qi chargers out today, and they’re among the first ones you can buy outside of an Apple Store that support 7.5W iPhone charging (only available on the iPhone X, 8, and 8 Plus), rather than just 5W. Buy one today and get 15% off, or buy two and save 20% on both. Your choices here are a charging pad or a charging stand. They both charge at thee same rate (7.5W for iOS, 10W for Samsung phones, 5W for everything else), and both include a Quick Charge 3.0 USB wall adapter, which is necessary to provide enough power. The prices above reflect 15% off with code POWER752. But if you buy two or more (one of each or multiples of the same), use code POWER753 instead to save 20%. There’s no such thing as owning too many Lightning cables, especially when you can get two of them (a 3' and a 6') for just $13 with promo code KINJA5LM. Hilariously, Apple still charger $19 for a single, 3' cable. USB-C Power Delivery chargers are finally starting to become more ubiquitous and affordable, and this $49, 21,000mAh model from iClever is one of the best deals we’ve seen to date. That gets you two regular USB ports (one of which has Quick Charge 3.0), a microUSB input, and a USB-C port that works as both an input and an output. The USB-C port also supports Power Delivery up to 30W, which is enough to charge a MacBook or a Nintendo Switch in portable mode, meaning you can play Zelda nonstop on even the longest flights. Just use promo code PDCHARGER at checkout to get the deal. If you’re planning on fleeing the country taking a trip overseas anytime soon, you’ll want to pack this universal outlet adapter, which can convert a UK/EU/US/AUS AC outlet into any other type of outlet, and includes four (!!) USB ports for your mobile devices too. Until such a time comes that AA batteries are banished from this Earth, it makes sense to invest in rechargeables. Get eight from AmazonBasics today for an all-time low $12. The government should mandate that all TVs come with at least five HDMI ports. I see no downside to this. Until I become president though, this $8 HDMI switcher will have to do. It basically turns one port into two, switches between devices at the press of a button. Just use promo code 4J45VSWY at checkout too get the deal. Break the cycle with Soylent, a nutritionally complete meal replacement shake that now comes in a variety of flavors (no, green is not one of them). Use promo code 10TRYSOYLENT to save $10 on a 12-pack of your favorite flavor, or a variety pack to try several. Score the best price ever on this 18-piece food storage set with snapping lids. These microwave and dishwasher containers are selling for a couple bucks less than usual, so if you’re in the market for some new leftover containers, I’d grab this deal before it’s gone. The #1 selling 10-inch frying pan on Amazon is just $26, which is about $9 less than usual. It has a stellar 4.6-star rating, is nonstick, and comes with a removable soft-grip silicone sleeve. Toss this $13 AmazonBasics umbrella in your car, work bag, or desk drawer. Today’s price is the lowest ever. You can thank us later. The best spatula is made of 100% silicone, and the best flipper is no different. This $12 flipper is $3 less than usual, can withstand heat up to 550 degrees, and you can throw it in the dishwasher when you’re done. Plus, today’s deal isn’t on an insane color like magenta or teal, but classic black. Climb into this Home Depot one-day sale on ladders with prices you won’t have to reach for. There are a couple different ladders and step stools to pick from, the tallest being this 22-foot Little Giant ladder for $270, down from its usual $290 (Amazon has even matched the price, if you prefer that route). This can become an A-frame ladder, an extension ladder, a 90 degree ladder, and even a stair ladder. Some of the options are already selling out, so grab these while you can. Just in time for picnic season, four different sizes of AO brand coolers are on sale for the best prices in about a year today. Similar to a Cricut machine, this Silhouette Portrait 2 precisely cuts fabric, paper, foam, vinyl, and more so you don’t have to pick up the scissors. You choose or create your own patterns on your PC or Mac, then plug the Silhouette into your USB port to make them real, just like a printer. This starter pack comes with 50 pre-made designs, 24 sketch pens, and 2 cutting mats. Today’s price is a good $60 less than usual, so go ahead, make Pinterest proud. While its grip might not be quite as secure as a perfectly-sized socket, this Tacklife universal socket can get a good-enough hold on almost any bolt, not to mention oddly-shaped things like hooks, without taking up a ton of space in your tool box. Get it for just $8 with promo code PE8DCHZL. Costa Rica is one of the most beautiful ecotourism destinations on the planet, and for those of us in the U.S., it’s not that hard to get to. And with this customizable travel package from TripMasters (in partnership with TravelZoo), it’s more affordable than you might think. Compared to other travel packages we’ve written about recently, this one offers a lot more flexibility, but also a ton of variance in price. Deals start at $779 per person leaving from Orlando, but you can pick pretty much any airport you want, and the site will price it out for you. I managed to find a six-night trip leaving from Raleigh-Durham for under $1,000 per person, for example. Once you’re there, you’ll spend at least three nights (you can add more) at a hotel of your choice near Arenal Volcano, and three nights (again, customizable) near Monteverde Cloud Forest (pictured). Each package includes your flights, airport transfers, hotels, and transportation between your two destinations. Just don’t forget your camera! Instead, just buy this tiny $22 compressor (with code HSE6VX3P), and fill up your own tires from anywhere. You can thank me later. You can expand your counter space with this rolling kitchen cart, and then collapse it back down for easy storage. It’s only $83 on Woot today, which is about $16 less than its Amazon price. Shipping is free for Prime members, and just $5 for non-members. Our readers love Lodge cast iron skillets. But have you tried out a Lodge dutch oven? This enameled red 6 Qt. one is just $45 today, which is a good discount from its usual $50 - $60. I have one and use it almost every time I cook. Plus, these make great gifts. If you don’t want your vacation days to go to waste this year, Gate 1 Travel (in partnership with Travelzoo) has a great package available right now that lets you experience multiple European cities for less than you might think. Each booking includes roundtrip air (priced from New York by default, but you can alter it to leave from basically anywhere), two nights in Amsterdam, a night in Bruges (it’s like a fairytale), and three nights in Paris, plus all transfers, English language tours, six breakfasts, and two dinners with wine. Prices start at $1709 per person (double occupancy) depending on the week, but for a limited time, promo code TZWBENX will take $210 off for each traveler, bringing it down to $1,499. I recently patched together my own European trip for this summer, and I can tell you that’d be a pretty decent price for airfare alone on a non-budget airline, not even accounting for the hotel stays and other extras. There’s nothing fun about fun-sized Snickers bars that leave you wanting more, but a real bar packs a gut-busting 280 calories. Now though, you can compromise with these mid-sized, 100 calorie alternatives, available in a box of 24 for just $9 on Amazon. Good luck not eating them all before Easter. Assuming you know enough about electrical work to not kill yourself, it’s not a bad idea to keep a wire stripper and crimper in your tool box, and this pair from Tacklife is just $11 with code YM3I4WHC. It’s too late to brighten your smile for Valentine’s Day photos, but it’s never a bad time to whiten your teeth, and Amazon’s running one of the best Crest 3D Whitestrips we’ve ever seen. Clip the $5 coupon on the product page, then use promo code 10CRESTWHITE at checkout to save an extra $10, bringing the 22-piece set down to $29. I continue to say this over and over again until you listen. The BEST TIME to buy winter apparel and boots is before and after the season starts. Right now, Nordstrom Rack is marking down a bunch of styles from The North Face, so you can stay warm now (if you need to) or just be prepared for next winter. It’s finally light enough after work to feel like you can go outside. And if you’ve been putting off going to the gym because the weather’s bad, time to give up. It’s getting nicer and nicer each day, and PUMA is taking an extra 20% off sale items with the code XTRA20. Let’s just say your wardrobe will look like it’s ready to hit the gym, even if you aren’t. If you need any type of activewear or sneakers in the next coming weeks now that it’s finally nice out, Reebok is giving you extra 40% off everything from their outlet shop, with the code FAMILY40. From sneakers, to running shorts, to bags to throw all your stuff into. Just use the code at checkout. $48 for a year’s-supply of razor blades is a great deal, especially from Dorco. $24 for the same pack (with code AF312FDP) is downright unbelievable. That price includes a mishmash of products, but basically, it boils down to 28 cartridges, including a mix of three, four, and six-blade models. Obviously, it depends on how often you shave, but for many of you, that should last at least a year. It would probably last me at least three. At $8 per month, Amazon Music Unlimited was already more affordable than Spotify Premium or Apple Music, but Amazon’s sweetening the pot today with a free 60 day trial, rather than the standard 30 days. Set a course for Amazon and prepare your warp drives, because this Star Trek: The Next Generation - The Complete Series Blu-ray set is just $86, the lowest price ever. If you’ve picked up a Raspberry Pi, and want to learn how to do more with it than just play old video games, Humble’s newest ebook bundle is a terrific deal. 14 how-to ebooks are split across three different price tiers, and you can download all of them DRM-free for as little as $15. Most of them focus on the Raspberry Pi, but there are a couple of Arduino books in there too for wannabe tinkerers. It turns out that Nick Offerman was pretty much playing himself during his years as Ron Swanson on Parks & Rec. His book, Good Clean Fun is a woodworking how-to book with a comedic side, and the Kindle version is just $2 today. DIRECTV Now Live a Little Package | $10 for First Three Months | Promo code YESNOW3. Cancel any time. If you want to stream all of the March Madness games at home (or at your desk) without a real cable subscription, DirecTV Now looks to be your cheapest option at the moment. The service’s base package includes TNT, TBS, TruTV, and CBS (in select markets), which together would cover all 63 tournament games. It normally costs $35 per month, but you can get your first three months for just $10 each with promo code YESNOW3. That’ll auto-renew at the regular price after the promotional period, but you can cancel any time, including after your first month, meaning you’d only pay $10 out of pocket for full tournament access. Alternatively, you can still prepay for three months at regular price ($105 total), and get a free 4K Apple TV, which normally costs $179 by itself. I did this myself a couple of weeks ago, and I’m really liking it. Nier: Automata is one of the best games you can own for your PS4, and Amazon just marked digital copies down to $30 for Prime members, the best price we’ve seen. Go read Kotaku’s review if you’re on the fence. If you’re still subjecting yourself to this misery, do yourself a favor and pick up this $10 wireless keyboard/trackpad remote (with promo code BQZZXVBB). It’s kind of ugly looking, but it’ll get the job done on your PS4, Xbox One, smart TV, or home theater PC. If you’re a fan of survival horror, you should absolutely pick up The Evil Within 2. Depending on the platform, Amazon has it priced at just $22-$24 today, only a hair above a $20 Gold Box deal they ran in January. Xbox One owners get the best price at $22, but the PS4 and PC versions are in the same ballpark. If you still haven’t picked up a PlayStation VR kit, I don’t think we’ve ever seen a better deal than this one. Just $350 gets you the headset, two Move controllers, the camera, Skyrim, Resident Evil BiohazardI, and Star Wars Battlefront II. The Skyrim VR bundle by itself has been an enticing deal at $350 in the past, so you’re getting a fantastic price on that, plus some bonus games for free. Update: For some reason I had it in my head that this was $300 when I first published the post, but it’s actually $350. It’s still a good deal, sorry about that! Update: The 20% discount is working on Smash now, if you weren’t able to get the deal earlier.